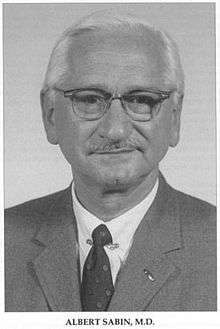 Albert Bruce Sabin (born August 26, 1906 Białystok) was a Polish American medical researcher, best known for developing the oral polio vaccine which has played a key role in nearly eradicating the disease. Sabin was born in Białystok, then part of Russia, to Ashkenazi-Jewish parents, Jacob and Tillie Krugman Saperstein. In 1922, he emigrated with his family to America. In 1930, he became a naturalized citizen of the United States and changed his name to Sabin. Sabin received a medical degree from New York University in 1931. He trained in internal medicine, pathology, and surgery at Bellevue Hospital in New York City from 1931–1933. In 1934, he conducted research at The Lister Institute for Preventive Medicine in England, then joined the Rockefeller Institute for Medical Research (now Rockefeller University). During this time, he developed an intense interest in research, especially in the area of infectious diseases. In 1939, he moved to Cincinnati Children's Hospital in Cincinnati, Ohio. During World War II, he was a lieutenant colonel in the U.S. Army Medical Corps and helped develop a vaccine against Japanese encephalitis. Maintaining his association with Children's Hospital, by 1946, he had also become the head of Pediatric Research at the University of Cincinnati. At Cincinnati's Children's Hospital, Sabin supervised the fellowship of Robert M. Chanock, whom he called his "star scientific son." Sabin went on a fact-finding trip to Cuba in 1967 to discuss with Cuban officials the possibility of establishing a collaborative relationship between the United States and Cuba through their respective national academies of sciences, in spite of the fact that the two countries did not have formal diplomatic ties. In 1969–72, he lived and worked in Israel as the President of Weizmann Institute of Science in Rehovot. After his return to the United States, he worked (1974–82) as a research professor at the Medical University of South Carolina. He later moved to Washington, D.C. area, where he was a resident scholar at the John E. Fogarty International Center on the NIH campus in Bethesda, MD. With the menace of polio growing, Sabin and other researchers, most notably Jonas Salk in Pittsburgh and Hilary Koprowski and Herald Cox in New York City and Philadelphia, sought a vaccine to prevent or mitigate the illness. The Sabin vaccine is an oral vaccine containing weakened forms of strains of polio viruses. In 1955, Salk's "killed" vaccine was released for use. It was effective in preventing most of the complications of polio, but did not prevent the initial intestinal infection. The Sabin vaccine is easier to give than the earlier vaccine developed by Salk in 1954, and its effects last longer. Sabin first tested his live attenuated oral vaccine at the Chillicothe Ohio Reformatory in late 1954. From 1956-1960, he worked with Russian colleagues to perfect the oral vaccine and prove its extraordinary effectiveness and safety. The Sabin vaccine worked in the intestines to block the poliovirus from entering the bloodstream. In the intestines, Sabin had discovered, the poliovirus multiplied and attacked. Thus, the oral vaccine broke the chain of transmission of the virus and allowed for the possibility that polio might one day be eradicated. Between 1955 and 1961, the oral vaccine was tested on at least 100 million people in the USSR, parts of Eastern Europe, Singapore, Mexico, and the Netherlands. The first industrial production and mass use of oral poliovirus vaccine (OPV) from Sabin strains was organized by Soviet scientist Mikhail Chumakov. This provided the critical impetus for allowing large-scale clinical trials of OPV in the United States in April 1960 on 180,000 Cincinnati school children. The mass immunization techniques that Sabin pioneered with his associates effectively eradicated polio in Cincinnati. Against considerable opposition from the March of Dimes Foundation, which supported the relatively effective killed vaccine, Sabin prevailed on the Public Health Service to license his three strains of vaccine. While the PHS stalled, the USSR sent millions of doses of the oral vaccine to places with polio epidemics, such as Japan, and reaped the humanitarian benefit. Indeed, it was not clear to many that the vaccine was an American one, financed by U.S. dollars, but not available to ordinary Americans. In 1983, Sabin developed calcification of the cervical spine, which caused paralysis and intense pain. Sabin revealed in a television interview that the experience had made him decide to spend the rest of his life working on alleviating pain. This condition was successfully treated by surgery conducted at Johns Hopkins Hospital in 1992 when Sabin was 86. A year later, Sabin died in Washington, D.C., from heart failure. 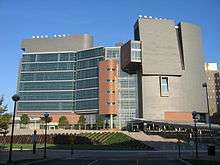 The CARE/Crawley Building houses the University of Cincinnati College of Medicine. The Cincinnati Convention Center was named after Sabin from 1985 to 2006. The street that runs between the University of Cincinnati College of Medicine and Cincinnati Children's Hospital Medical Center was renamed Albert Sabin Way on April 28, 2000. On March 6, 2006, the US Postal Service issued an 87-cent postage stamp bearing his image, in its Distinguished Americans series. ↑ Brown, Emma. "Robert M. Chanock, virologist who studied children's diseases, dies at 86", The Washington Post, August 4, 2010. Accessed August 9, 2010. ↑ Jiménez, Marguerite (June 9, 2014). "Epidemics and Opportunities for U.S.-Cuba Collaboration". Science & Diplomacy. 3 (2). ↑ Sabin A.B. (1987). "Role of my cooperation with Soviet scientists in the elimination of polio: possible lessons for relations between the U.S.A. and the USSR". Perspect Biol Med. 31 (1): 57–64. doi:10.1353/pbm.1987.0023. PMID 3696960. ↑ Benison S (1982). "International Medical Cooperation: Dr. Albert Sabin, Live Poliovirus Vaccine and the Soviets". Bulletin of the History of Medicine. 56: 460–83. ↑ Philip Boffey, Sabin, Paralyzed, Tells of Death Wish. In the New York Times, November 27, 1983. ↑ Ezra Bowen, The Doctor Whose Vaccine Saved Millions from Polio Battles Back from a Near-Fatal Paralysis. In People, July 2, 1984. ↑ Health Care; The Fight Against Death. Special comment by Keith Olbermann on Countdown, 2009-10-07. ↑ Bonfield, Tim (July 5, 1999). "Sabin has been snubbed before". The Cincinnati Enquirer. Gannett Company. Retrieved October 11, 2015. ↑ "Albert Sabin Way to be dedicated". University Currents. www.uc.edu. April 21, 2000. Retrieved March 7, 2016. Saldías G, Ernesto (December 2006). "Centenary of Albert B. Sabin MD birthdate". Revista chilena de infectología : órgano oficial de la Sociedad Chilena de Infectología. 23 (4): 368–9. doi:10.4067/S0716-10182006000400013. PMID 17186087. Smith, Derek R; Leggat Peter A (2005). "Pioneering figures in medicine: Albert Bruce Sabin--inventor of the oral polio vaccine". The Kurume medical journal. 52 (3): 111–6. doi:10.2739/kurumemedj.52.111. PMID 16422178. Emed, A (April 2000). "[Albert B Sabin (1906-1993)]". Harefuah. 138 (8): 702–3. PMID 10883218. Chanock, R M (March 1996). "Reminiscences of Albert Sabin and his successful strategy for the development of the live oral poliovirus vaccine". Proc. Assoc. Am. Physicians. 108 (2): 117–26. PMID 8705731. Dalakas, M C (May 1995). "Opening remarks. On post-polio syndrome and in honor of Dr. Albert B. Sabin". Ann. N. Y. Acad. Sci. 753: xi–xiv. PMID 7611615. Beumer, J (1994). "[Academic eulogy of Professor Albert Bruce Sabin, foreign honorary member]". Bull. Mem. Acad. R. Med. Belg. 149 (5–7): 220–4. PMID 7795544. Horaud, F (December 1993). "Albert B. Sabin and the development of oral poliovaccine". Biologicals. 21 (4): 311–6. doi:10.1006/biol.1993.1089. PMID 8024745. Melnick, J L; Horaud F (December 1993). "Albert B. Sabin". Biologicals. 21 (4): 297–303. doi:10.1006/biol.1993.1087. PMID 8024743. "Homage to Albert Sabin". Biologicals. 21 (4): 295–384. December 1993. doi:10.1006/biol.1993.1087. PMID 8024742. Newsom, B (June 1993). "In memoriam: Albert B. Sabin, M.D., 1906-1993". Journal of the South Carolina Medical Association (1975). 89 (6): 311. PMID 8320975. Grouse, L D (April 1993). "Albert Bruce Sabin". JAMA. 269 (16): 2140. doi:10.1001/jama.269.16.2140. PMID 8468772. Koprowski, H (April 1993). "Albert B. Sabin (1906-1993)". Nature. 362 (6420): 499. Bibcode:1993Natur.362..499K. doi:10.1038/362499a0. PMID 8464487. Sabin, A B; Ramos-Alvarez M; Alvarez-Amezquita J; Pelon W; Michaels R H; Spigland I; Koch M A; Barnes J M; Rhim J S (June 1984). "Landmark article Aug 6, 1960: Live, orally given poliovirus vaccine. Effects of rapid mass immunization on population under conditions of massive enteric infection with other viruses. By Albert B. Sabin, Manuel Ramos-Alvarez, José Alvarez-Amezquita, William Pelon, Richard H. Michaels, Ilya Spigland, Meinrad A. Koch, Joan M. Barnes, and Johng S. Rhim". JAMA. 251 (22): 2988–93. doi:10.1001/jama.251.22.2988. PMID 6371279. Benison, S (1982). "International medical cooperation: Dr. Albert Sabin, live poliovirus vaccine and the Soviets". Bulletin of the history of medicine. 56 (4): 460–83. PMID 6760938. Dixon, B (December 1977). "Medicine and the media: polio still paralyses (Albert Sabin, Jonas Salk)". British journal of hospital medicine. 18 (6): 595. PMID 342023. Draffin, R W (January 1977). "Citation for Dr. Albert B. Sabin of Charleston, S.C. on presentation of Honorary Fellowship 1976". The Journal of the American College of Dentists. 44 (1): 28–30. PMID 320241. Wikimedia Commons has media related to Albert Sabin.